This page is a repository for various photographs from albums of family members, generally of the Scott Family from Waskatenau, Alberta. The collection includes photographs contributed by various members of the family. During the last 100 years my first and second cousins and their children and grandchildren have take up residence in many countries. Often they have with them photographs for which they do not know the persons shown. 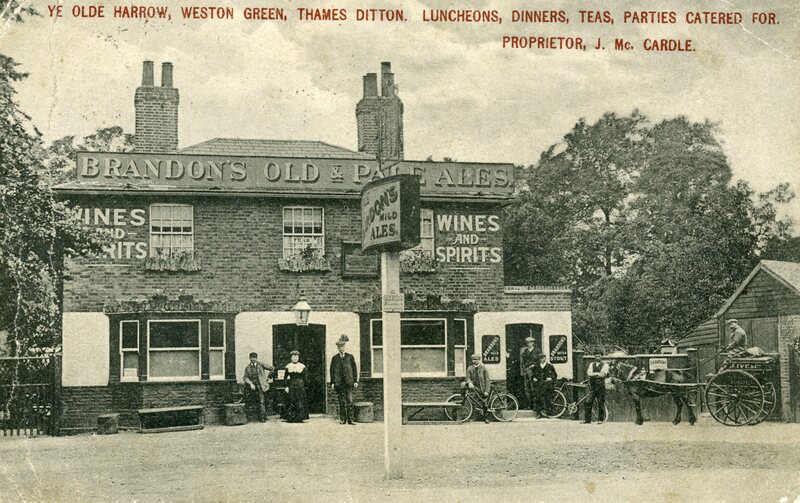 Hopefully this site will allow us to, as a family place names and events to the photographs. If you can help by identifying or adding to the collection please contact me. I have chosen to display the photographs sorted roughly by decade -- but I might not always be right. In some instances the photographs are not of family members but are of interest if only to wonder who and why they are in the family albums. Have finished my country job another seems to be very little in shape but I go up tomorrow. They have just buried poor old Fred Wilmer. I suppose you heard of his death in hospital. hope you are very much better. Had Polly been in hospital and was recuperating? Who was Bill. And who was poor old Fred Wilmer? 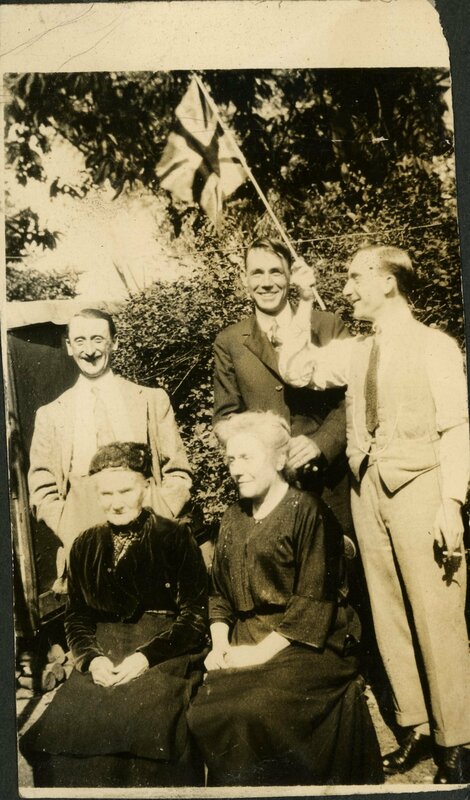 This is a photograph taken on an outing by Elsie Ribbins, Bert Fry, his wife Lillian (Scott) Fry and Sydney Scott. Bert was the avid amatuer photograher to whom we are indebted for many early family photos. This particular one was snapped by Sydney. 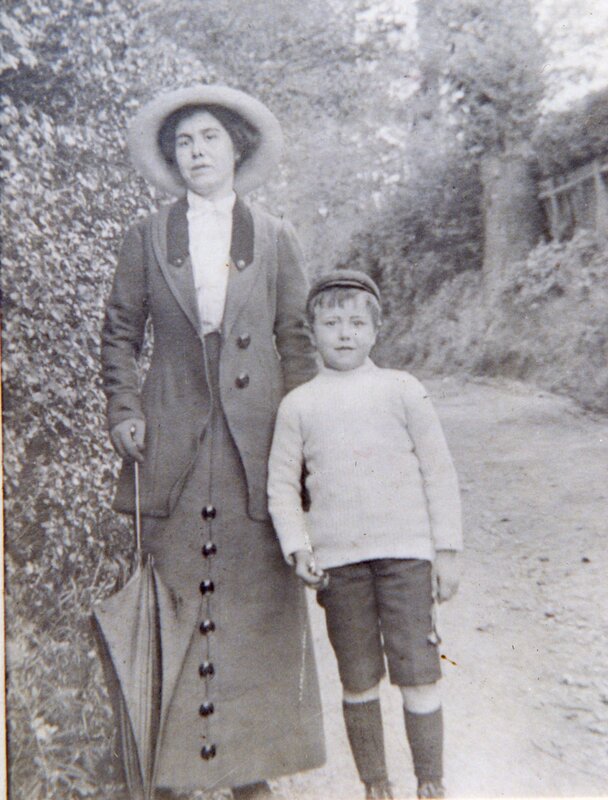 Lillian (Scott) Fry and her son Francis Fry who was born in 1907. The photograph was likely taken by Bertram Fry, Lillian's husband who was an avid photographer. 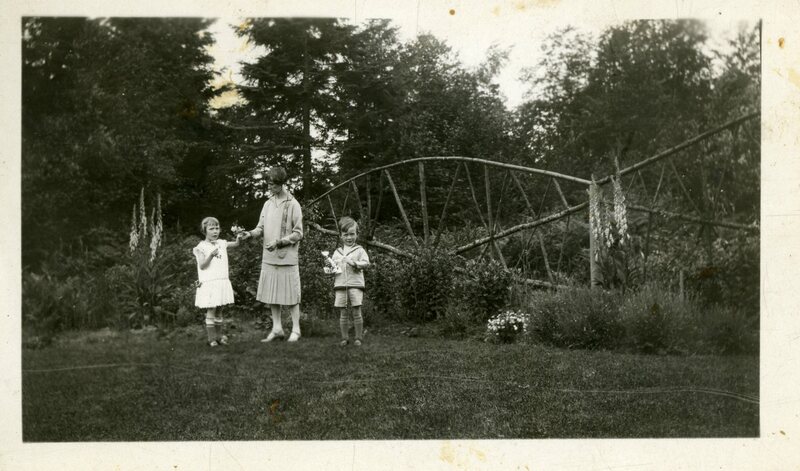 This was taken in the late spring or early summer of 1918. 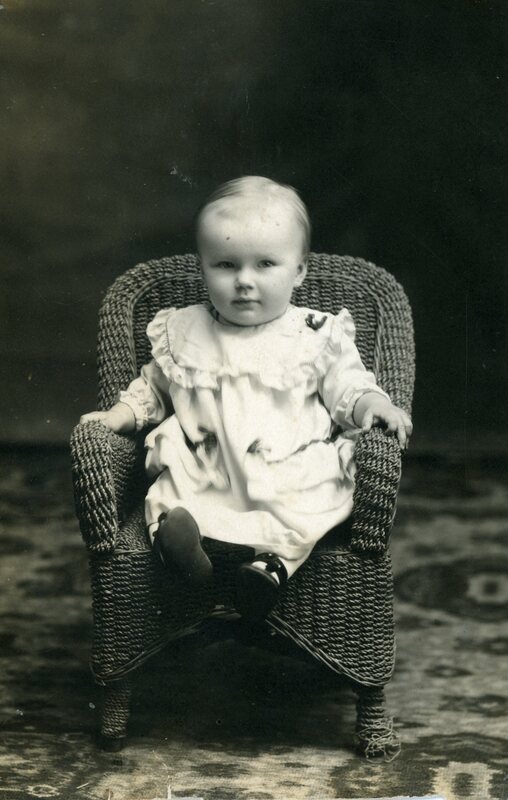 Leonard was born on Noevember 19 1917 and appears in this photograph to be about 6 to 8 months of age. 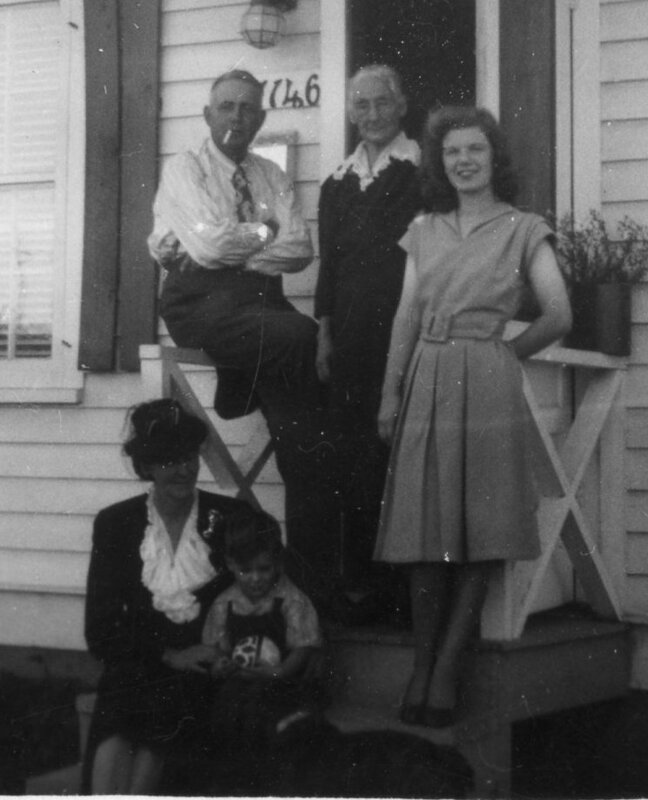 From left to right, Frank Scott, his son Leonard and his in-laws, Polly and Edward Melbourne. This appears to be taken at the Melbourne home in Waskatenau. The remains of the house are still (just) visible (2011) at the homestead which is now owned by the Melbourne's great grandson, Wayne Scott. It seems likely that this photograph was taken by Elsie (Melbourne) Scott as she does not appear in the photograph. The photo was taken in the summer of 1918. This photograph was probably taken just after WWI, in the summer of 1919. 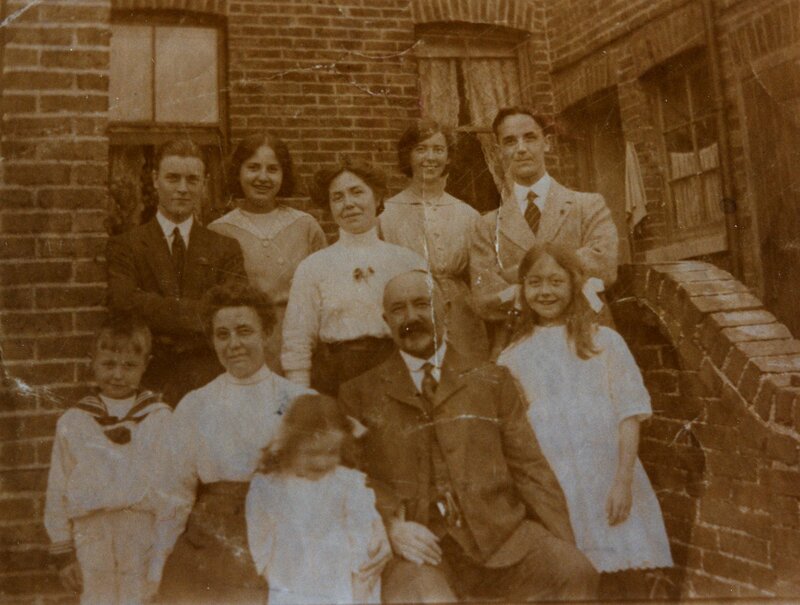 In front: Norman Fry, Julia (Slape) Scott, Hilda Fry, Walter Scott, Lillian (Babs) Fry. Arthur had been a prisoner of war in WWI. 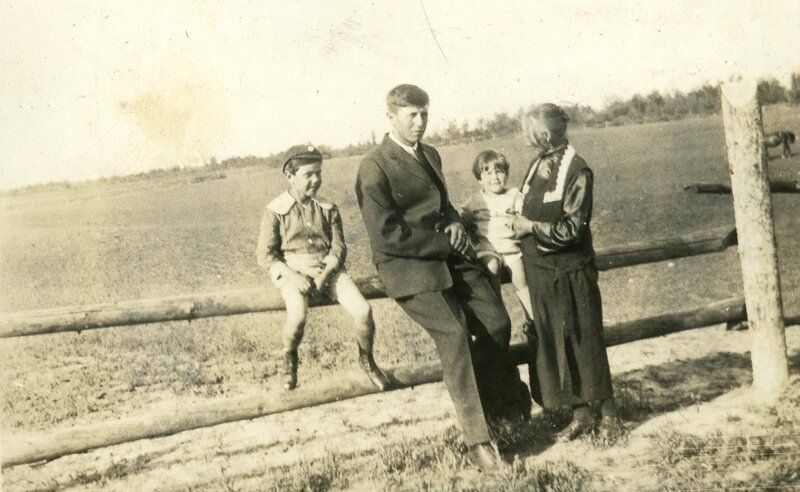 By the time this photo was taken, Walter's son Frank, who emigrated to Canada in 1909, had been joined by Lillian's son Francis Fry. Lillian was widowed in a non-war related accident in 1916. 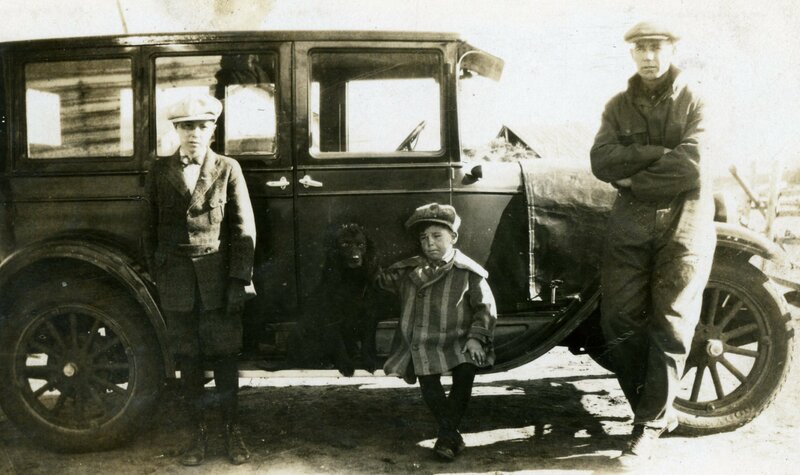 This photograph has some information that might be of assistance in determining who the child is. 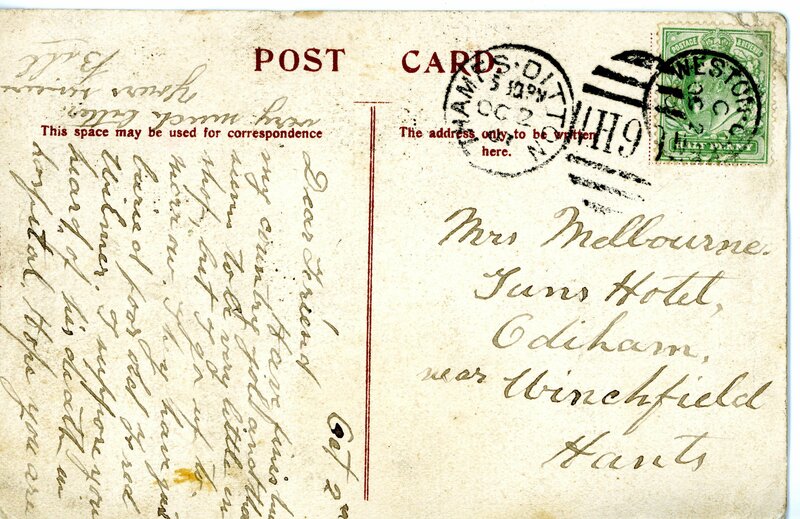 The photograph is mounted on a post card. On the reverse side we see that the card is made in Canada. 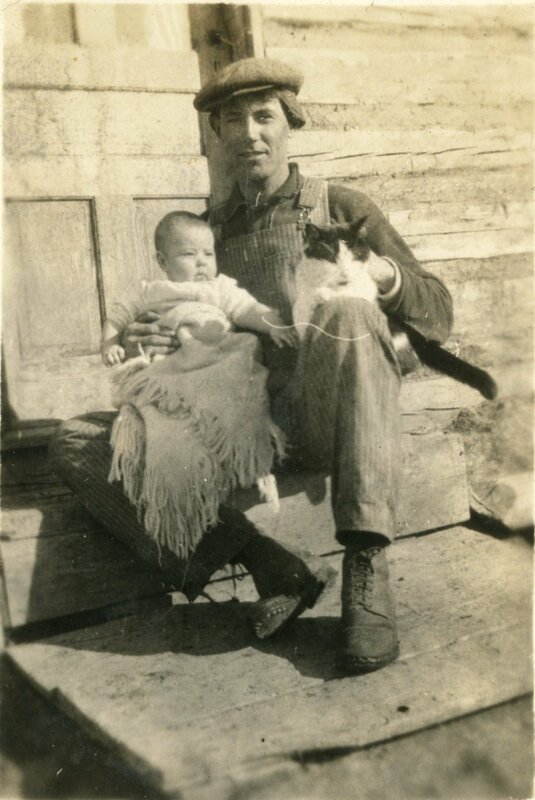 There is a date, April 14, 1925 and an indication that the child's name is "H. Scott", or perhaps "M. Scott". But who can that be? How old is this child? Perhaps about 2 years. Leslie Scott was born on Aug 23, 1922, but I do not think this is him. Does anyone recognize the chair or the carpet? The original photo is on the far left with a close-up of the people in the center. I believe the venue is the Scott Farm in Waskatenau. The lady's dress would indicate this is from the 1920s. 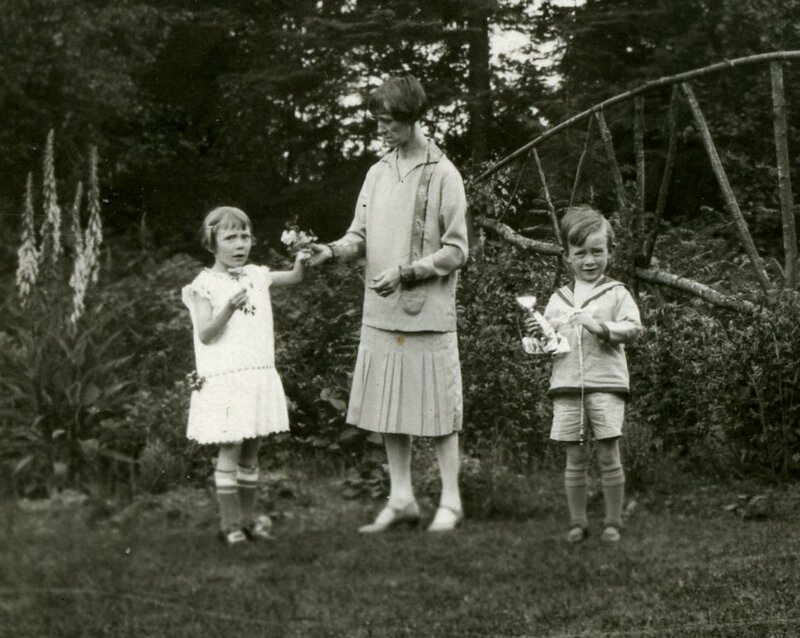 The photo has written on the back that it is Elsie Scott with her grandchildren Kenneth and Sandra, but that is clearly not correct. on the left, Leonard Scott, Francis Fry, Leslie Scott and Polly Melbourne. It is interesting to see the large cleared field behind them. 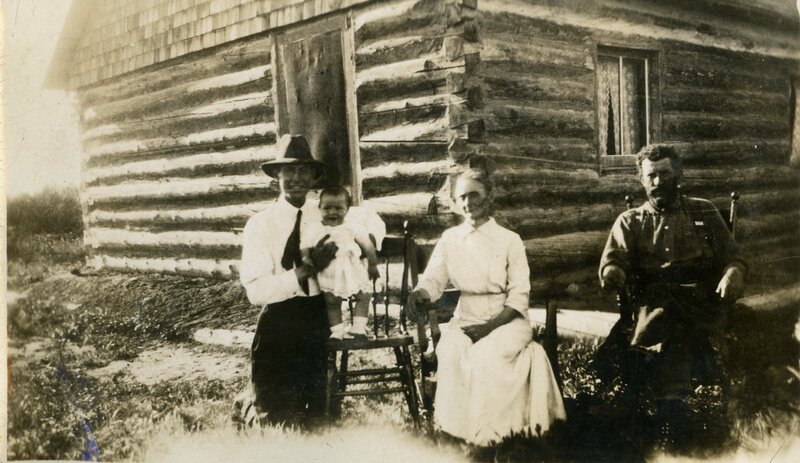 This will have been taken at Frank's homestead about 10 years after he became an active farmer. On the right. 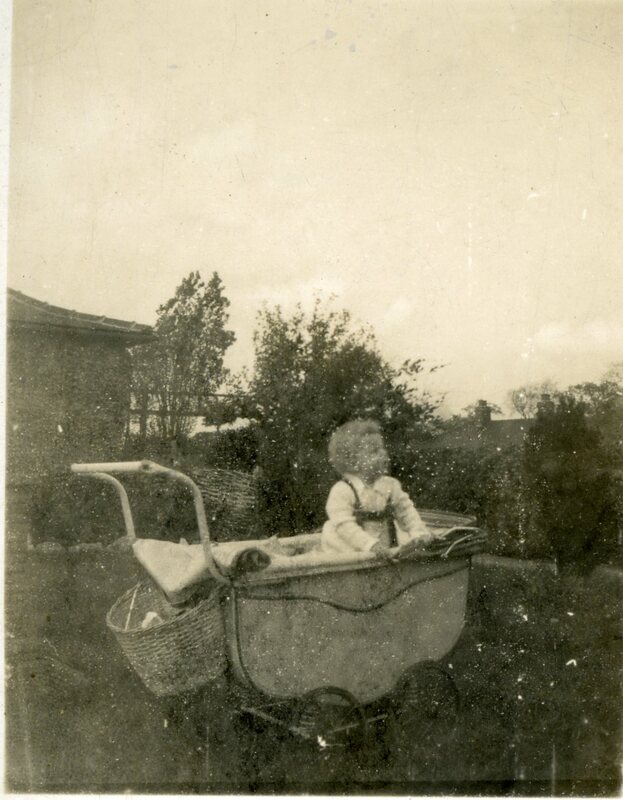 Is this Leonard Melbourne with his wife Sarah and baby Mary in the pram? About 1928, Frank Scott made his first trip back to England after emigrating to Canada. I await confirmation of the other persons in this family photo which was taken during this visit. In the center are Polly Melbourne and her daughter Elsie Scott. Who are the other two ladies? The house in the background is the home of Frank and Elsie. Later in the 1930s the house was clad in clapboard. The painted rocks on the right were one of Elsie's decorative touches which she maintained at the farm into the 1950s. 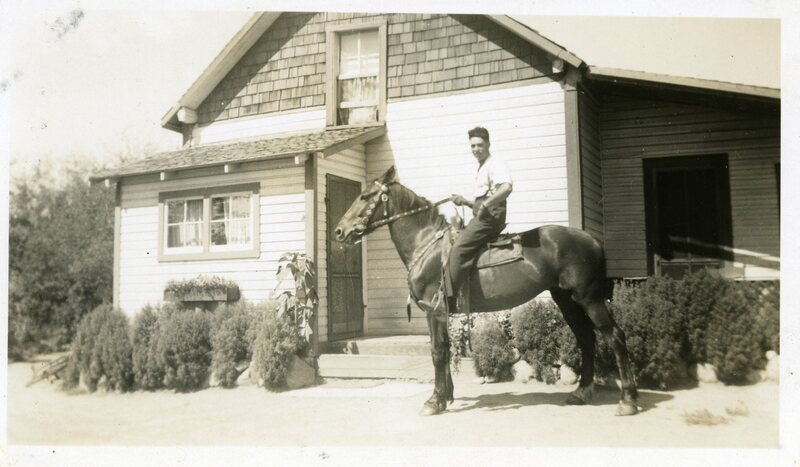 Leonard Scott on his pony is the description on the back of this photograph. The original log structure of the Frank Scott home has been cald with wood siding, an improvement that occured around the early 1930s. Leslie Scott took pilot's training for a month in 1941, from the middle of June until the middle of July. He was "CT'd" (ceased training) after a crash from which he fortunately walked away without any injury to his person and the remustered as a navigator student. 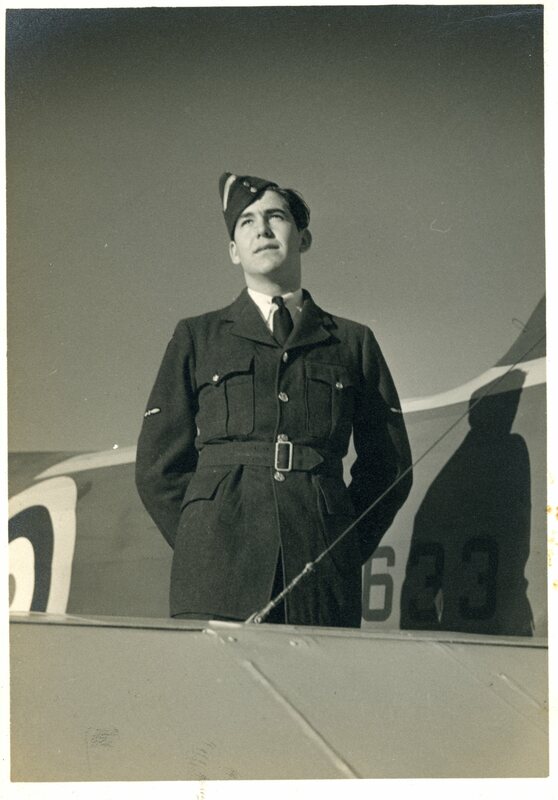 In this photograph he is wearing the rank of an LAC (Leading Aircraftsman) and the white flash of a pilot trainee. The photograph was taken at the RCAF Station, Lethbridge, Alberta, one of the many training bases in Canada of the British Commonwealth Air Training Plan. 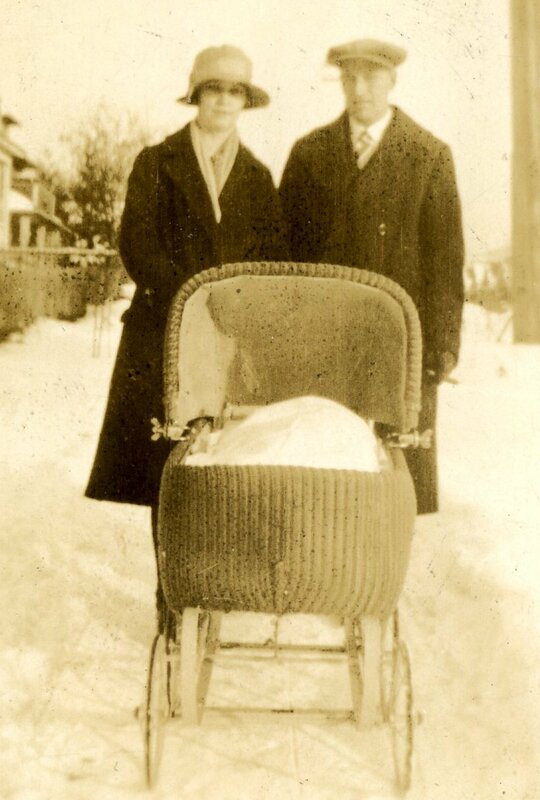 Arthur was the adopted son of Alphonse and Clotilda Monserez, named after a son of theirs who had drowned in the North Saskatchewan at Edmonton in 1910. Arthur joined the R.C.A.F. in WWII and became a pilot. This photo was probably taken before he left for England as he is wearing Sergeant's stripes and his pilot's wings. He was killed in England in a plane crash on January 17, 1942. The following information is taken from the Commonwealth War Graves website. Son of Alphonse and Clotilda Monserez, of Waskatenau, Alberta, Canada. 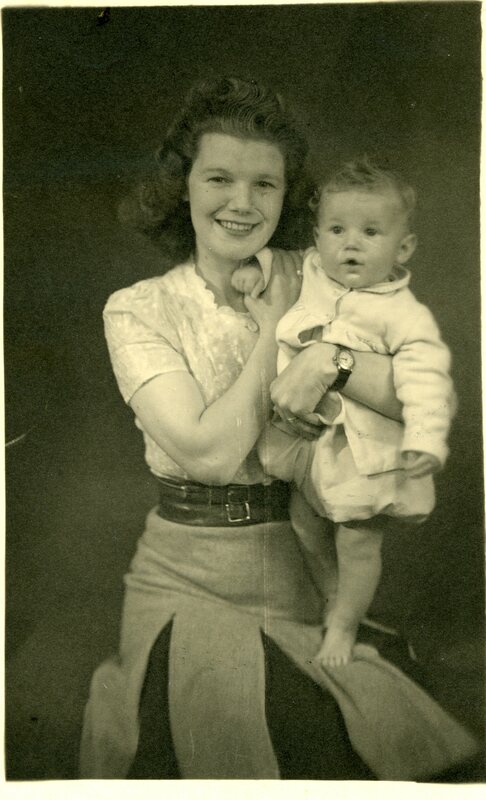 This photograph was likely taken about June 1942 when Kenneth was about a seven months old and just before Leslie departed for his tour of duty with 1407 Met Flight. These photos were taken in early-1944 when his father Leslie came to the U.K. on leave during his operational tour in Iceland. The photo on the right shows Leslie wearing the crown of a Warrant Officer 2nd Class (WO2) which he wore for only a short time before being commisioned.I believe this was taken in Thornbury, England where Phyllis and Ken were staying during his Iceland tour. Leslie was on his way to London to get his officer's uniform. Note the period style perambulator (pram) and also the harness Kenneth is wearing. The harness had an attachment for a leash so that he could be restrained when on his feet. 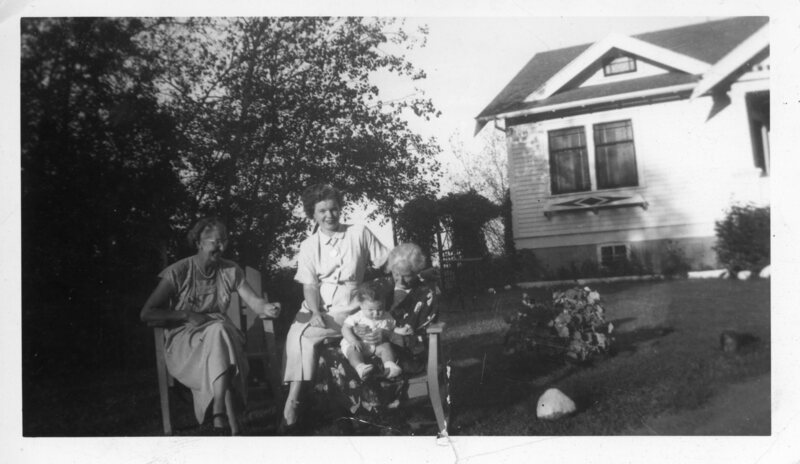 This photograph was taken on the front porch of the house at 11146 - 70th St. in Edmonton. 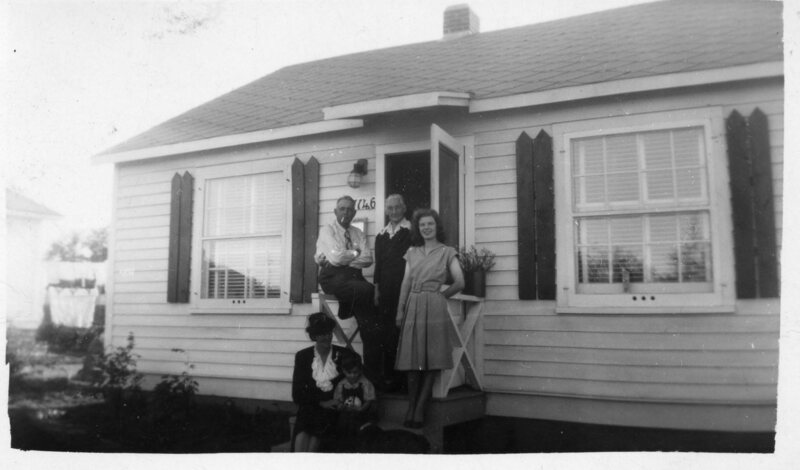 This house was purchased by Leslie Scott using his discharge bonus from the RCAF and the family lived there from 1946 to about 1950. The house is no longer there. It was demolished many years ago to allow construction of the Capilano crossing of the North Saskatchewan (now named after Wayne Gretsky). 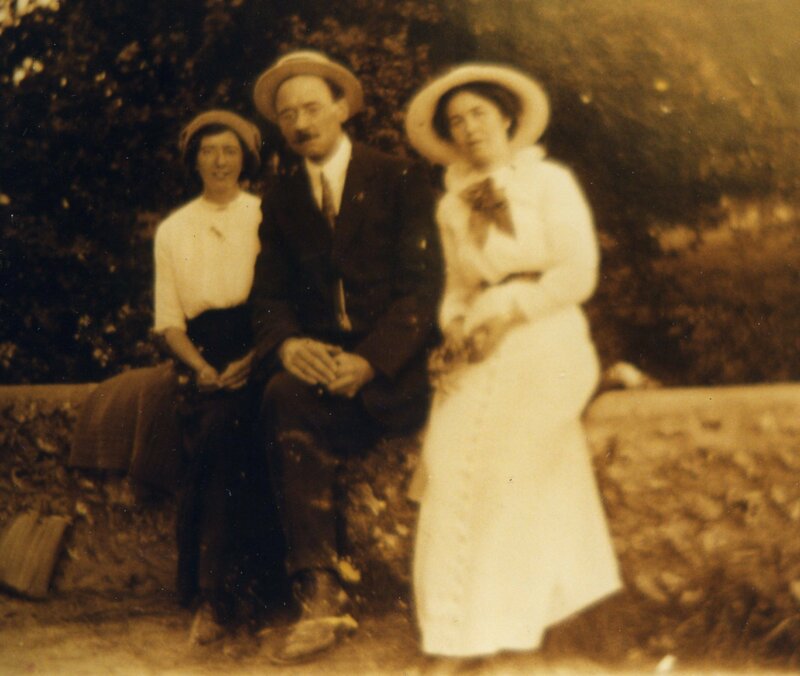 Standing are Frank Scott, his mother-in-law Polly Melbourne and his daughter-in-law, Phyllis Scott. Seated are Elsie and Kenneth. 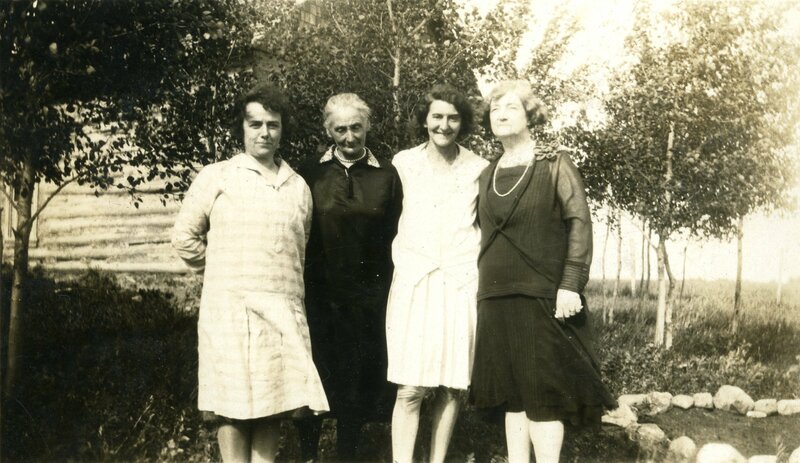 The photograph was apparently taken by Leslie who would have given four generations in a line had he been in the photograph. 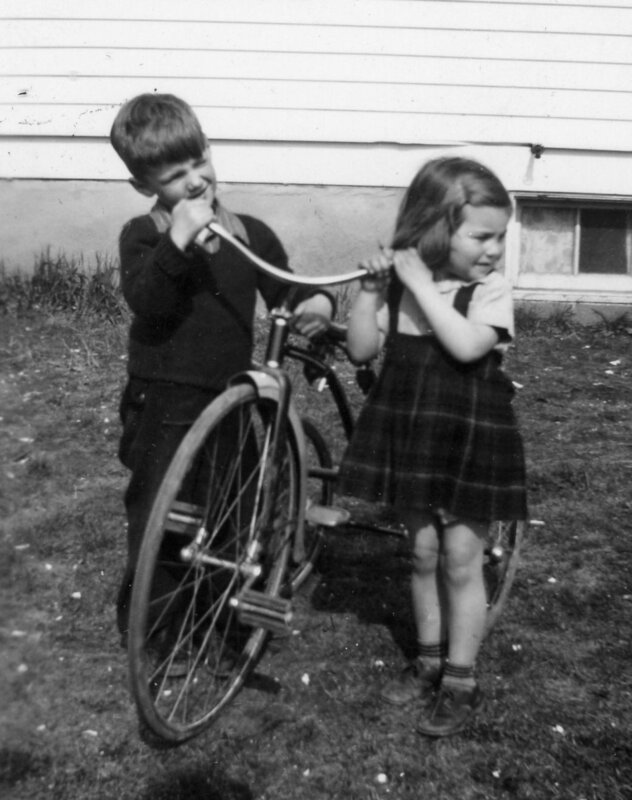 This photograph was taken on the front lawn at the Scott Farm in Waskatenau in the summer of 1951. Morgan Scott born 18 November 1950 is sitting on the lap of his great-grandmother Polly Melbourne who appears to be almost asleep. 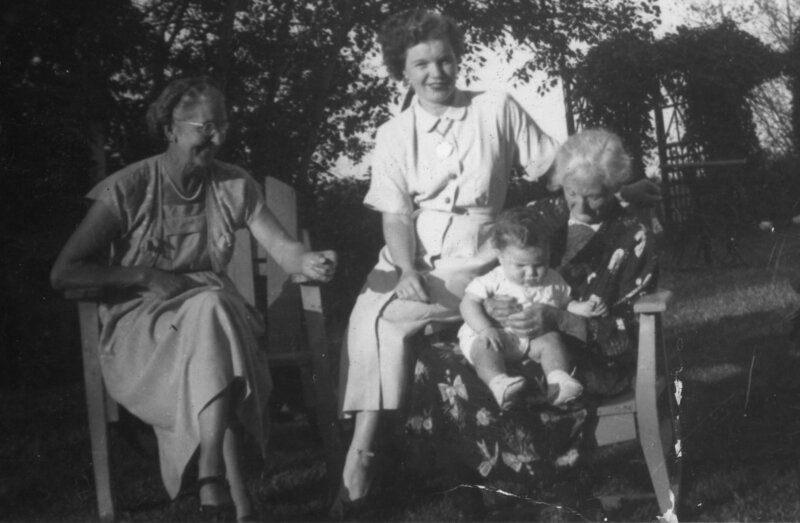 His mother Phyllis is sitting on the arm of the chair and his grandmother Elsie Scott is on the chair to their right. This photograph was also apparently taken by Leslie who would have given four generations in a line had he been in the photograph. 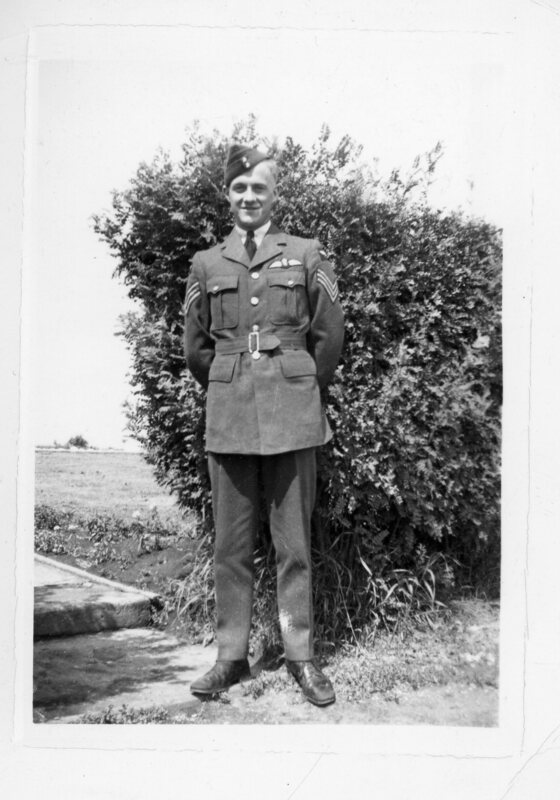 This photograph was taken in the back yard of our house at 20 Cedar Crescent at the RCAF Base in Namao, just north of Edmonton. We lived in this house for about 2 years and while here Leslie was the mayor of the community for about a year. 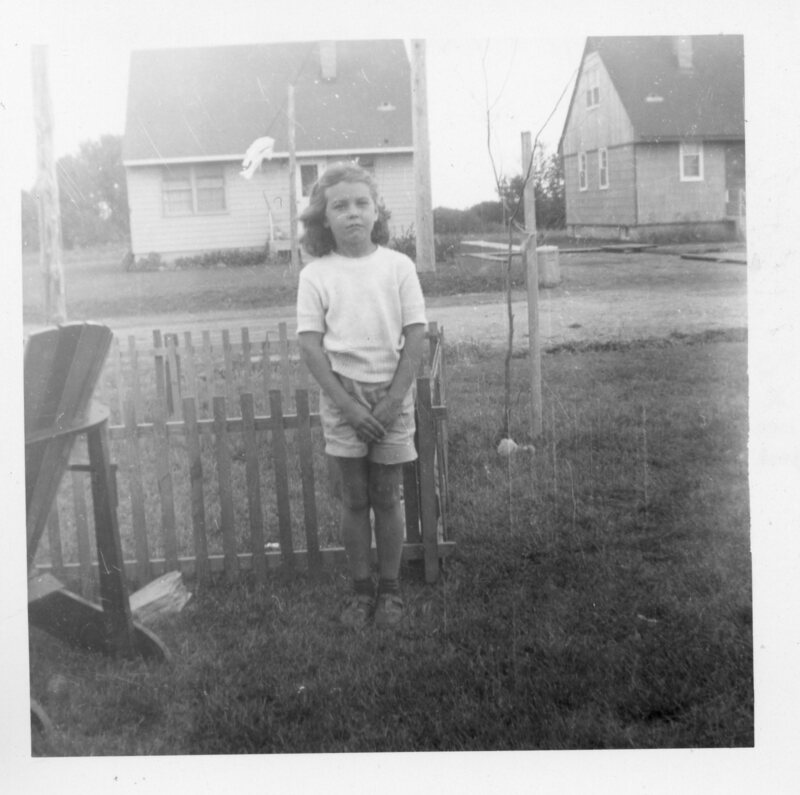 Sandra is about 8 years old in this photograph. Behind her, the little picket fence area encloses a play area for Morgan who was about two at the time. 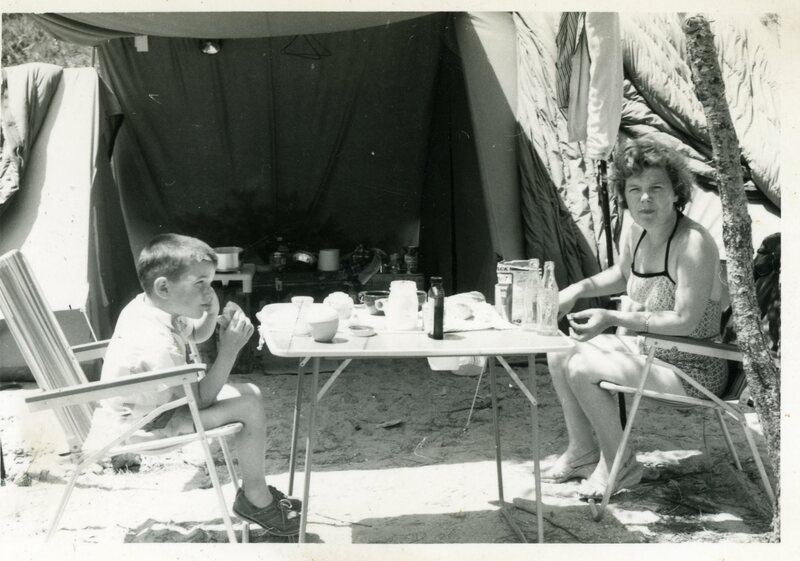 Morgan Scott and his mother Phyllis probably at the campground in St. Tropez, France. The tent configuration clearly identifies this as a 1958 photograph. I am indicating the sources that I have used to scan these photos. In some cases I have more than one copy and it may be that you provided me with one and I have not so acknowledged. No offense is meant and please feel free to contact me so that I can acknowledge your contribution.